Before the couple undergoes the process of IVF, the two will first need to select an IVF clinic that they are comfortable with, for both consultation and the procedure itself. The woman, specifically, will first go through 2-3 weeks of hormone treatment. During the treatment, the woman has to go through daily hormone injections or prescribed ingestible pills and/or drugs. Afterwards, the couple have to travel to the IVF clinic again for the collection of embryos, which is typically on average 32 embryos per woman. After 3-4 days the couple will return again for embryo transplantion. Which then enters the longest two weeks of the couples life. During this time, couples can do nothing but wait to see if the IVF procedure is successful. There is only a 30% chance of successful pregnancy and the rest result in failure of starting a family. The couples that experienced failure must then go through the procedure again. However they will have to wait around 2 months before the woman can go through the procedure again. On average each couple goes through this cycle 3 times, once through the full cycle and twice through shorter cycles with frozen embryos from the first cycle. As a result, couples generally wait 9 months before a successful pregnancy, costing the couple a total of $16,000. Insurance companies do not generally cover this cost so couples must pay out-of-pocket. 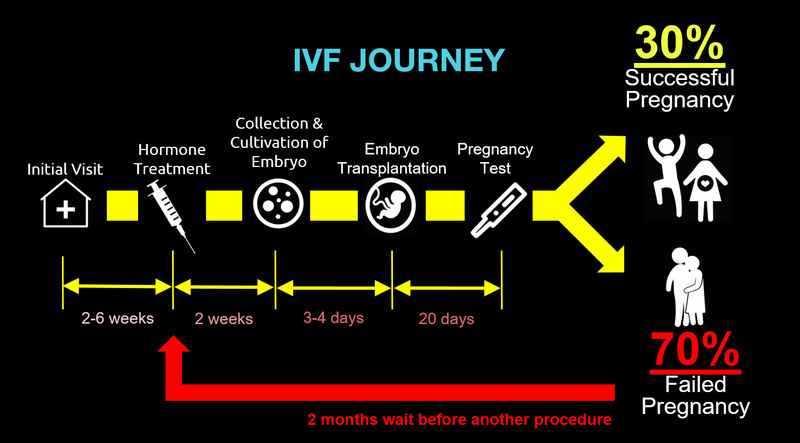 The IVF journey is not only time consuming but also expensive and emotionally taxing on couples. During this time, couples experience doubt, false hope, and other emotions that are detrimental to their relationship and mental health. A major contribution to such a high failure rate results from the current embryo screening method, which entails taking out the embryo out of the incubator, looking at it under the microscope, and then putting it back into the incubator. The decision is based only on looking at the morphology or physical appearance of the embryo. This is a subjective way of selecting embryos and we see an opportunity to improve upon current methods.